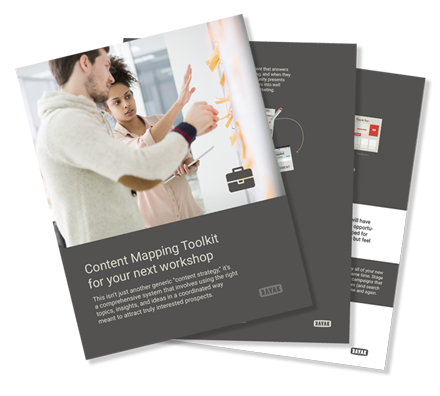 This Content Mapping Toolkit will identify gaps in your Buyer's Journey. This isn't just another generic "content strategy," it's a comprehensive system that involves using the right topics, insights, and ideas in a coordinated way meant to attract interested individuals. The most effective business websites craft their information to answer their ideal customer’s needs. For this to be most effective, you want to create content that speaks to a single persona during each of the buyer stages (Awareness, Consideration, Decision). Once you do this, you’ll start to find that you are guiding your customers to a solution that’s right for them rather than selling them. If your company has multiple personas they are selling to, content will have to be optimized for each one. Also, if there are multiple problems or opportunities that your company can answer, content will have to be developed for each one. This toolkit is best completed during a personal consultation but feel free to try it on your own as a starting point for later discussion. Initiate a content plan to fill those gaps or create new campaigns. Stop wondering what's not working. Shed some light on the weaker parts of your buyer pathways with this workshop toolkit. Get the toolkit or better yet, book a workshop.